As many Irish companies have their parent companies in the US, or are affiliates of US companies, the following might be of interest to the LGBT community and its supporters here. You can now quickly view the particular company by category online, and view its LGBT equality rating, to make an informed decision on whether or not to buy that company’s products. In the US, as the holiday shopping season kicks off, equality-minded shoppers can stand with companies who stand with the LGBTQ community, by using the new Human Rights Campaign (HRC) Foundation’s consumer guide to hundreds of American companies, to choose brands and retail outlets committed to LGBTQ-inclusive workplace policies and practices. The Buying for Workplace Equality guide, released by the HRC Foundation, was first issued more than a decade ago. It provides invaluable consumer information, based on company scores reported in HRC’s annual Corporate Equality Index (CEI), as well as HRC-researched data on additional well-known companies and their brands. said Deena Fidas, Director of HRC Foundation’s Workplace Equality Program. Through the CEI, the HRC Foundation proactively rates more than 1,000 Fortune 500 companies, and top law firms, on LGBTQ-inclusive workplace policies and practices. The new guide includes more than 750 companies, 600 of them rated in the CEI, and an additional 140 independently researched by the HRC Foundation. A total 5,600 affiliated businesses and brands are featured in this year’s report. The Buying for Workplace Equality guide sorts businesses by sectors, assigning them a score ranging from zero to 100, based on LGBTQ workplace equality, as measured by the CEI and HRC-researched data. Now more than ever, the HRC feel it is important to support businesses that support equality. 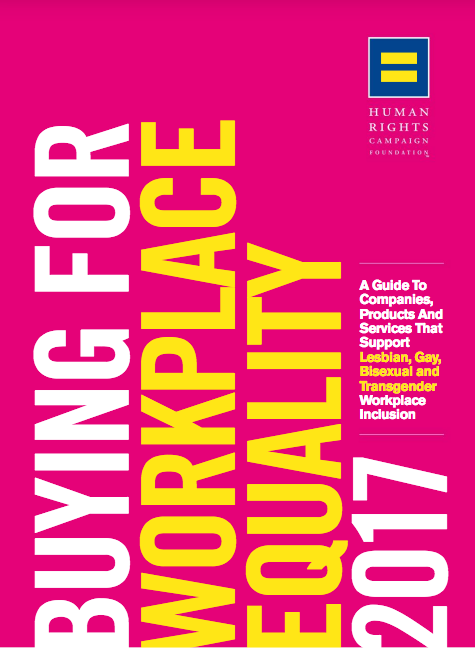 For more information on the Buying for Workplace Equality guide, and to search by company category, go online to www.hrc.org/buyersguide.